Sunday, September 3 is the chance to celebrate dads around the nation courtesy of Father’s Day. Coinciding with the first weekend of spring, it’s the perfect opportunity to enjoy all the fun, excitement and vibrancy on offer as the city of Sydney awakens from the chill of winter. Father’s Day dates back to the Middle Ages, when the Catholic Church in Europe began noting the important influence of fathers in society as part of St Joseph’s Day on March 19. As a quick refresher, St Joseph is recognised as husband of the Virgin Mary and legal father of Jesus Christ. 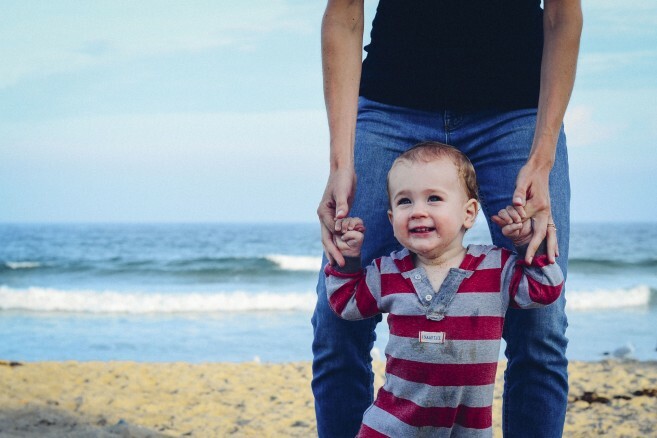 After a few false starts elsewhere, the Father’s Day trend finally spread in the 20th century with dads being rightfully recognised around the world. The date that nations choose to celebrate Father’s Day varies, but in Australia it always falls on the first Sunday in September. In Greece, like many other European nations, Father’s Day is known as the Fête des Peres or Feast of Fathers. The event is marked on the third Sunday in June. You’d think that celebrating dads would have been a fairly obvious event to mark on the international calendar, but by all accounts it took a long time for the occasion to catch on. In fact, the Father’s Day most nations now celebrate involved a 64-year road to fruition that was largely centred around the US, and it had its genesis in tragedy. In December 1907, there was a major mining disaster in Monongah, West Virginia when 361 men were killed including 250 fathers. It left around 1000 children without their dads. The following year one of those children suggested to her local pastor they should honour the fathers who were lost. Honour them they did, but the event was not well promoted and it wasn’t until 1911 that the concept was raised again. This time Father’s Day was proposed in Chicago as a citywide celebration, but was ultimately turned down. 1912 saw another attempt as part of a Father’s Day church celebration in Vancouver Washington, and then the Lions Club took on the cause in 1915, making an appeal to have it recognised as a national holiday. In 1916, President Woodrow Wilson spoke at a Father’s Day celebration and sought to make it an officially recognised federal holiday. US Congress apparently resisted, fearing that it would become commercialised. In 1972 the day was finally made a permanent national holiday when President Richard Nixon signed it into law. The ABC notes one of the first mentions of Father’s Day in Australia was seen in the Newcastle Sun on September 4, 1936. “The article promoted a Father’s Day meeting at the Baptist Tabernacle, with reference to hopes the day would become as popular as Mother’s Day. “The idea had also surfaced a week earlier on August 29, 1936 in The Daily News Perth, with an advertorial suggesting gifts to be given on the day. “But an article in the Western Herald in 1964 said the day was first celebrated in 1935. “The same article explained the day was officially designated as the first Sunday in September through the Commonwealth in 1964. They also note 50 per cent of all Father’s Day cards are purchased for fathers. Almost 20 percent of Father’s Day cards are given to husbands. Other categories include grandfathers, sons, brothers, uncles and someone special. Humorous cards account for about 25 percent of Father’s Day sales, and Hallmark has been producing Father’s Day cards since the early 1920s. Meanwhile, it’s believed a Babylonian youth named Elmesu carved the first known Father’s Day card in clay nearly 4000 years ago. His special message wished his father good health and a long life. Socks, jocks, cards and mugs may be a welcome token of appreciation for dad, but according to Science Daily, experiences are better than material items. They note: “experiential gifts are more effective than material gifts at improving relationships from the recipient’s perspective”. “The reason experiential gifts are more socially connecting is that they tend to be more emotionally evocative,” the report’s authors say. “An experiential gift elicits a strong emotional response when a recipient consumes it — like the fear and awe of a safari adventure, the excitement of a rock concert or the calmness of a spa — and is more intensely emotional than a material possession. With the ultimate experience in mind, our top tips for gifts this year are firmly focussed on spending quality time with dad. There are a host of great venues at Darling Harbour to help you enjoy just that. SEA LIFE Sydney Aquarium is spoiling all super dads this Father’s Day weekend with a special Dads Go Free entry offer. The venue is offering a magical underwater adventure for the whole family, with dad’s ticket on the house. They note dad is entitled to one free entry to SEA LIFE Sydney when accompanied by a full paying customer (adult or child). The offer is valid from August 31 to September 2, 2018. Unleash dad’s inner super hero with an unmissable experience at Madame Tussauds as the acclaimed venue rolls out all the best and brightest super heroes. In an experience that’s set to delight the young and the young at heart, Madam Tussaud’s will be serving up some serious justice. The interactive exhibition runs until December 31, but Father’s Day could be the perfect time to embrace a little action and adventure with dad. The Australian National Maritime Museum consistently offers up a wealth of events destined to delight the whole family. And if dad has a nautical nature, it’s a great place to celebrate his special day. Feature events running across Father’s Day include James Cameron’s Challenging the Deep, Action Stations, the 53rd Wildlife Photographer of the Year exhibition, and the Box That Changed the World. 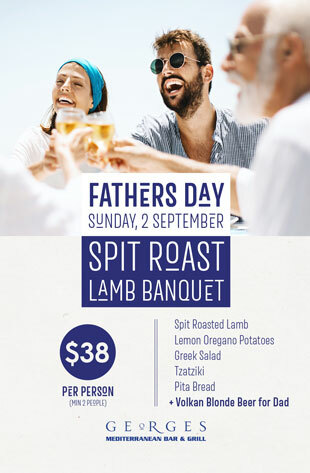 Amidst a day spent enjoying a wealth of Darling Harbour fun and adventure with dad, seize the opportunity to step into spring and enjoy a special Father’s Day lunch at George’s Mediterranean to mark the occasion. This year we’re going all out for dad to celebrate. In addition to our regular a la carte menu, we will be featuring a Spit Roast Lamb Banquet. Set against the sparkling backdrop of a spring Sydney day overlooking Darling Harbour this is destined to be a popular event, and there will be limited availability. You can make a booking and learn more about our special Father’s Day lunch here. Any memorable experience is as much about the journey as it is the destination, so why not enjoy a little sightseeing along the way. Darling Harbour can be accessed by light rail, train, bus or a stroll from the CBD. Or take in some sensational spring time water views courtesy of a water taxi or the ferry.